Christopher Henry, Nevada Bureau of Mines and Geology, University of Nevada, Reno, Reno NV. 89557, USA. Christopher Stevens, Susan Varve, and Stacey Wetmore Ottawa-Carleton Geoscience Centre, Department of Earth Sciences, Carleton University, 1125 Colonel By Drive, Ottawa, ON. K1S 5B6, Canada. David John, US Geological Survey, 345 Middlefield Road, Menlo Park CA. 94025, USA. The Great Basin of the western United States is a region of Cenozoic extension, plutonism and volcanism that includes the state of Nevada and parts of eastern California, western Utah, and southeastern Oregon. Although the igneous history of this region does not fall within the traditional defined volume or timing of LIP’s (large igneous provinces) or SLIPs (silicic LIPs) (Ernst and Jowitt, 2013; Ernst, 2014), it is still includes a series of voluminous igneous events that cover a large region of the western United States. Much of the igneous activity, especially in northern and central Nevada, pre-dates the onset of the main phase of Basin and Range extension at ~ 17 Ma (Colgan et al., 2006a; Colgan et al., 2006b; Colgan and Henry, 2009). In western Nevada and eastern California, the timing of lithospheric extension and volcanism are more closely linked (e.g., Nelson and Tingey, 1997; Ormerod et al., 1988; Rogers et al., 1995). The driving forces behind volcanic activity exposed in the Great Basin are varied, and include subduction of the Farallon (now Juan de Fuca) plate beneath North America, mantle upwelling related to continental rifting or a mantle plume in the northern Great Basin, and lithospheric extension and thinning. Of these, the dominant driver of Cenozoic igneous activity was subduction of the Farallon plate and associated slab rollback (e.g., Henry et al., 2009; Humphreys et al., 2003; Humphreys, 1995; Menzies et al., 1987; Noble, 1972; Ormerod, 1988). Beginning at approximately 70 Ma, the volcanic arc associated with subduction of the Farallon plate migrated rapidly eastward from the Sierra Nevada to New Mexico and Colorado (Coney and Reynolds, 1977). The rapid convergence of the two plates resulted in shallow-dipping “flat-slab” subduction, where the Farallon plate directly underlay the North American plate without an intervening mantle wedge, thus shifting volcanic arc activity far to the east. Between 45 and 40 Ma, the distal end of the slab steepened, generating a hinge of the subducting plate that began to migrate back towards the west, producing the southwestward “sweep” of igneous activity across Nevada (Figure 1) (Coney and Reynolds, 1977; Dickinson and Snyder, 1978; Henry et al., 2009; Humphreys, 1995). Thus, subduction-related magmatism moved across Nevada between 45 and 3 Ma, resulting in the emplacement of calc-alkaline plutons, basaltic through high-silica rhyolitic lavas and caldera-related pyroclastic deposits of the Ignimbrite Flare-up (e.g., Best et al., 2013a; Busby et al., 2008b; Christiansen and McKee, 1978; Colgan et al., 2011; Cousens et al., 2008; Daley and DePaolo, 1992; du Bray et al., 2013; Henry, 2008; Henry and John, 2013; John et al., 2012; Noble, 1972; Timmermans, 2015). Subduction-related volcanism ceased in the Great Basin as the slab hinge migrated beneath the Sierra Nevada and as the Mendocino triple junction migrated northward between ca. 15 and 3 Ma (Cousens et al., 2008; Henry et al., 2009). However, broadly bimodal basalt-rhyolite volcanism related to extension along the margins of the Great Basin has continued through the Pliocene and Quaternary (e.g., Cousens et al., 2012; Cousens et al., 2011; Daley and DePaolo, 1992; Farmer et al., 1989; Johnsen et al., 2010; Ormerod et al., 1988; Rogers et al., 1995). Figure 1. A. Map of Nevada showing the distribution of calderas (red circles) and the migration of the arc front from the Eocene to the Miocene. Dashed box shows the region in Figure 1B. B. Regional geology map of the Fish Creek Mountains area. Modified from John et al. (2000). The northern Nevada Rift (NNR) is expressed as a prominent aeromagnetic anomaly that extends from the Nevada-Oregon border to southeastern Nevada (Blakely and Jachens, 1991; John et al., 2000; Zoback et al., 1994). The NNR is considered to be an intra-continental rift, possibly related to the Yellowstone hotspot and/or the Columbia River flood basalts/LIP (Camp et al., 2015; Colgan, 2013; John et al., 2000; Ernst and Buchan 2001). This feature is not related structurally to extension in the Great Basin because the orientation of the NNR is different from the long-term Great Basin extension direction, possibly due a transient extension direction related to initiation of the Yellowstone hot spot (Colgan, 2013). The NNR includes numerous north-northwest-trending dykes, volcanic flows and domes that range in age from 16.5 to 14.7 Ma (John et al., 2003; John et al., 2000; Wallace and John, 1998). The volcanic rocks range from basalts through trachydacites and rhyolites. Northern Nevada, northeastern California, southern Oregon and southwestern Idaho host a widely-exposed series of low-potassium mafic volcanic rocks termed high-alumina olivine tholeiites (HAOT) (Hart, 1985; Hart et al., 1984). These lavas range in age from 10.5 to 0 Ma, and no significant trend in age with geographic location is evident (Hart et al., 1984). The geochronological data suggest that the HAOT were emplaced during three pulses, at 7 to 10, 3.5 to 6, and 0 to 2.5 Ma, and cumulatively represent an eruptive volume of ~650 km3 (Hart et al., 1984). The volcanic rocks are tholeiitic and have major and trace element characteristics similar to those of mid-ocean ridge (MORB) or back-arc basin basalts, but they have radiogenic isotopic compositions that are distinctly non-MORB-like and vary smoothly with latitude (Hart, 1985; Hart et al., 1997). The isotopic variations in the HAOT suite can be modeled by mixing of depleted upper mantle with ancient, enriched subcontinental lithospheric mantle. Magma sources west of 118oW are depleted, whereas those east of 116oW are enriched, and sources between those latitudes are a mixture of the two (Hart et al., 1984; Hart et al., 1997). During the Pliocene and Quaternary, volcanic activity in the Great Basin has largely been restricted to its margins (e.g., Kempton et al., 1991; Rogers et al., 1995). Most Pliocene-Quaternary lavas and cinder cones are interpreted to be derived by melting of ancient, subduction-modified subcontinental lithospheric mantle (e.g., Daley and DePaolo, 1992; Farmer et al., 1989; Ormerod et al., 1988). However, at least two small-volume intraplate volcanic fields of this age range are known in the central Great Basin: the Lunar Crater and Buffalo Valley volcanic fields (Arehart and Coolbaugh, 2003; Cousens et al., 2013; Dickson, 1997; Stickney, 2004; Yogodzinski et al., 1996). Unlike earlier Cenozoic volcanism in the Great Basin, magmas feeding these two volcanic fields are mildly alkaline with within-plate (“ocean island”) basalt-like trace element patterns, consistent with magmas being derived from the asthenosphere. Their radiogenic isotopic characteristics are also consistent with melting of the asthenosphere, trending towards ratios for depleted upper mantle compared to the mantle sources of calc-alkaline Eocene to Miocene subduction-related volcanic rocks in the central Great Basin (e.g., Best et al., 2016; Yogodzinski et al., 1996). On the western margin of the Great Basin, similar small-volume volcanic fields with primarily asthenospheric mantle sources are found east of Reno in the Carson Sink (Cousens et al., 2012) and in the Mojave Desert (Farmer et al., 1995; Glazner et al., 1991; Miller et al., 2000). These four intraplate volcanic fields overlie lithosphere that is no longer fusible but is thin enough to allow melting of the asthenosphere, which appears to be a rare occurrence in the most recent history of the Great Basin. The Fish Creek Mountains (FCM) are located in north-central Nevada, 40 km southwest of the city of Battle Mountain (Figure 1). The FCM, along with the adjacent Tobin Range to the west, Battle Mountain and the Sheep Creek Range to the north, and the Shoshone Range to the east, has a long and complex geological history (Emmons and Eng, 1995; McKee, 1970; Stevens et al., 2012; Stewart and Carlson, 1976; Varve et al., 2012). The Cenozoic igneous history of the region includes the emplacement of Eocene basaltic to rhyolitic lavas and diorite to granodiorite plutons, late Eocene rhyolitic ash-flow tuffs and plutons, late Oligocene rhyolitic ash-flow tuffs, Middle Miocene volcanic rocks of the NNR, early Pliocene HAOT, and finally Pliocene-Quaternary intraplate alkaline basalts (Figure 2). Thus, the FCM region includes representatives of all major Cenozoic volcanic events in Nevada. Figure 2. Geology of the Fish Creek Mountains area (legend in upper left) and sample locations (legend in lower right: Cove Mine = tuff of Cove Mine; FCM-Tobin Lavas = Eocene lava flows; Buffalo Valley = Pliocene-Quaternary cones and flows of the Buffalo Valley volcanic field). Range on the right side of the map is the Shoshone Range. The FCM region presents a unique opportunity to evaluate the factors behind magma generation over a 40 Ma period in one small area within the northern Great Basin. The range of rock types found in the region, from basalt to high-silica rhyolite, suggests major differences in mantle and crustal contributions to Great Basin magmas. Other than the igneous activity itself, no major modifications to the crust occurred during this time period, although contributions from lower (mafic) and upper (granite plus sedimentary) crust may have varied with time. In contrast, changes in tectonic setting may have resulted in tapping of different mantle sources over time, resulting in significant changes in geochemistry and radiogenic isotope composition. The goals of this contribution are to describe the geological and geochemical characteristics of each of these volcanic events, and to evaluate variations in mantle and crustal sources for magmas in this restricted region in north-central Nevada. 2.0 Geology of the Fish Greek Mountains Region. The FCM is a broadly circular range surrounded by alluvial valleys, and differs from the adjacent ranges in that it is not appreciably tilted by Basin and Range extension. The oldest rocks in the FCM are Paleozoic sedimentary rocks that are exposed along the southwest side and north end of the range, and also make up most of the adjacent Tobin Range, Battle Mountain, and northern Shoshone Range (Figure 2) (Stewart and Carlson, 1976). Jurassic intrusions are found in the FCM region, including two in the FCM, and Cretaceous intrusions occur at Battle Mountain (Theodore, 2000). The Mesozoic plutons are considered to have been emplaced in a “back-arc” setting to the Sierra Nevada arc (e.g., Dickinson, 2013). Late Eocene (ca. 40 to 38 Ma) granitoid plutons and associated dikes are widely scattered in the FCM, Battle Mountain, and the northern Shoshone Range (Henry and John, 2013). These intrusions are the earliest manifestation of Cenozoic subduction-related magmatism in the region following a long hiatus that began in the Late Cretaceous (e.g., Dickinson, 2006). Several of these intrusions are noteworthy for their significant genetically related base and precious metal deposits (e.g., ca. 39–38 Ma Copper Canyon, Elder Creek, Fortitude, and Phoenix deposits at Battle Mountain and the ca. 39 Ma Cove and McCoy deposits in the FCM). The Eocene plutons are not spatially associated with coeval volcanic rocks. However, the 34.4 Ma tuff of Cove Mine unconformably overlies the Brown stock at the Cove Mine in the FCM (Johnston et al., 2008) and the Copper Canyon stock at Battle Mountain (Theodore and Blake, 1975; Seedorff, 1991). This relationship indicates rapid and significant uplift (likely several kilometers) and erosion of these areas between ca. 38 and 35.8–34.4 Ma, just before major caldera-forming ignimbrite eruptions began in the region. The oldest Cenozoic volcanic rocks in the FCM region are exposed in the Toiyabe and Shoshone Ranges below rocks of the Caetano caldera, one of the larger calderas in north-central Nevada (John et al., 2008). The pre-Caetano lavas are andesite to dacite in composition, and range in age from 39.0 to 35.2 Ma (John et al., 2008; Watts et al., 2016). The northern arm of the FCM is primarily composed of the 34.4 Ma tuff of Cove Mine (Figure 3A). In the FCM, the tuff is approximately 200 m thick and includes at least two cooling units that fill a paleovalley. Outcrops of this tuff are also found in the Shoshone Range east and northeast of the Fish Creek Mountains, as well as along the east side of Battle Mountain. Previously mapped as Caetano Tuff (Emmons and Eng, 1995; McKee, 1970), the tuff of Cove Mine is a slightly less evolved, less silicic tuff that pre-dates the eruption of the Caetano Tuff at 34.0 Ma (Henry and John, 2013; John et al., 2008). 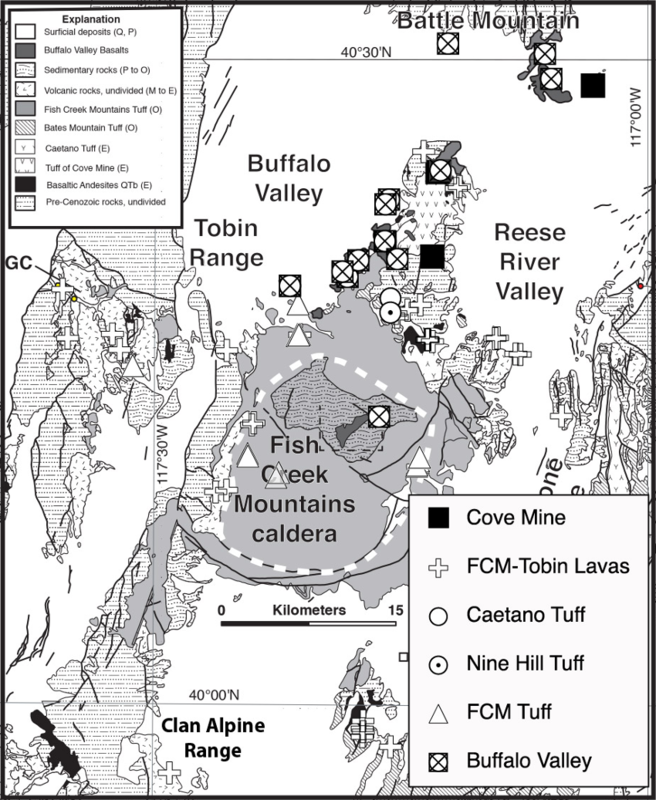 Henry and John (2013) propose that the source of the tuff of Cove Mine is a caldera buried beneath the Reese River Valley just east of the FCM. Petrographically, the tuff of Cove Mine is richer in biotite and hornblende than the Caetano Tuff (John et al., 2008) and has a lower SiO2 content. The tuff is locally underlain by > 34.4 Ma basaltic andesite flows that are aphyric, green to red-brown in colour, and rarely vesicular (samples 08-BV-10, -11, Cousens et al., 2013; Emmons and Eng, 1995). Figure 3. Field photos of the rock units in the Fish Creek Mountains area. All photos by B. Cousens. A. Quaternary Buffalo Valley spatter cone emplaced on the two cooling units of the 34.4 Ma tuff of McCoy Mine (light grey) with alluvium in the foreground. B. Tilted outcrop of Eocene andesite lava flows in the Horseshoe Basin, Fish Creek Mountains, with C. Stevens. C. Exposure of the caldera wall of the Caetano caldera, Toiyabe Range. D. Cliff exposures of intracaldera ignimbrites of the Fish Creek Mountains tuff, east side of caldera. E. Extracaldera unwelded tuffs, basal Fish Creek Mountains tuff. Note both white and grey pumices as well as lithic fragments. F. Welded Fish Creek Mountains tuff. Fiamme have undergone devitrification producing spherulites. G. Gently south-tilted flows of the northern Nevada rift, Shoshone Range. H. The Pumpernickel Valley HAOT flows, with C. Henry. Much of the central part of the FCM, the western edge of the adjacent Shoshone Range, and the Golconda Canyon section through the Tobin Range consists of late Eocene to early Oligocene basalt through rhyolite flows and domes (Figure 3B) (Emmons and Eng, 1995; Gonsior and Dilles, 2008; John et al., 2008; Stevens et al., 2012). 40Ar-39Ar dates from a basalt, a basaltic andesite, an andesite and a dacite from the FCM yield ages between 33.66 +/- 0.06 and 34.04 +/- 0.05 Ma, essentially coeval with activity at the Caetano caldera. A post-caldera andesite flow in the Caetano area is dated at 33.55 Ma in age (Watts et al., 2016). At Golconda Canyon in the Tobin Range, two ignimbrites below the andesite sequence were dated at 33.48 to 33.23 Ma (Gonsior and Dilles, 2008), and thus some of the intermediate composition lava flows in the Tobin Range are slightly younger than the dated lava flows at FCM. At the northwest end of Golconda Canyon, the “Older Basalt” unit of Gonsior and Dilles (2008) (our sample 10-BV-42, a basaltic andesite) is overlain by the Caetano Tuff and must be older than 34.0 Ma. The only true mid-Cenozoic basalt (sample 13-BV-07) in the study area is from the central FCM (“Pinnacle Mountain”, Emmons and Eng, 1995), a greenish lava with rare olivine microphenocrysts. Basaltic andesites range from aphyric to mildly plagioclase-pyroxene phyric (15 to 20% total crystals) with rare amphibole. Andesites and trachyandesites are commonly plagioclase-porphyritic, with pyroxene or hornblende (10-30% total crystals). Plagioclase phenocrysts commonly display sieve texture, indicative of magma mixing and disequilibrium, which is very common in Great Basin andesites (e.g., Cousens et al., 2008; Timmermans, 2015). Hornblende crystals commonly have opaque reaction rims that sometimes extend into the core, likely due either to shallow degassing or slow magma ascent across the amphibole stability field limit (Rutherford et al., 1998). Dacites were sampled at Red Butte (mapped as QTa, Stewart and Carlson, 1976), immediately south of the FCM, and as a clast in the 24.9 Ma Fish Creek Mountains Tuff (FCMT) (Figure 2). Dacitic samples contain 1-3 mm, sericitized sieve textured plagioclase phenocrysts that are in disequilibrium with the melt, with minor pyroxene and reaction-rimmed biotite phenocrysts. Rhyolite samples from domes and flows were collected from either the western and central FCM or the southern Shoshone Range and typically contain phenocrysts of plagioclase in moderate disequilibrium, K-feldspar, reaction rimmed biotite, and minor quartz; however, rhyolites tend to be the less porphyritic than other rock types. Most of the rhyolite samples come from the 33-34 Ma Pinnacle Mountain flow dome complex, consisting of flow-banded, glassy lava that is commonly a cliff-forming unit (Emmons and Eng, 1995). The central FCM around Pinnacle Mountain includes minor exposures of the Caetano Tuff (Figure 3C) and the 25.4 Ma Nine Hill Tuff, the most widespread pyroclastic unit in the Great Basin (Deino, 1985; Henry and John, 2013). The source of the Nine Hill Tuff was suggested to be buried beneath the Carson Sink in western Nevada (Deino, 1985; Henry and Faulds, 2010), but recent field work in the western Clan Alpine Mountains has uncovered a caldera of Nine Hill age (C. Henry, personal communication, 2018). The southern FCM is composed of the FCM caldera filled by rhyolitic ignimbrites of the 24.91 +/- 0.03 Ma FCMT (Figure 3D). The caldera is anomalously young for its position in the western Nevada volcanic field, part of the mid-Cenozoic “Ignimbrite Flareup” in the Great Basin (Henry and John, 2013). Most calderas in this part of the belt are ca. 34 Ma in age, e.g., the Caetano caldera, and the locus of ca. 25 Ma explosive volcanism is ~150 km to the south and southwest (Henry and John, 2013). The caldera is also unusual in that it is non-resurgent and has no recognized ring-fracture volcanism. The caldera also sits in a region of low-magnitude extension that separates two regions of higher extension to the west and east (Colgan and Henry, 2009; Colgan et al., 2008; Gonsior and Dilles, 2008). Because it is so little extended, the caldera is negligibly tilted. No immediately pre-caldera or post-caldera igneous activity has been recognized. The FCM caldera forms an approximately circular range with an areal extent of 520 km2 and an average relief of 500 m, with a shallow central basin. The rim is broadest and highest in elevation in the western and southern parts of the range. Virtually all of the estimated 310 km3 of ignimbrites are bound within the caldera (McKee, 1970), with only a small volume of nonwelded tuff (Figure 3E) exposed outside the west side of the caldera (McKee, 1970; Varve et al., 2011) and a single outflow tuff found in the Golconda Canyon paleovalley in the Tobin Range (Gonsior and Dilles, 2008). The nonwelded tuff is aphyric and pumice-rich with abundant lithic clasts, and is well-exposed at two low hills at the mouth of Daisy Canyon (Figure 2). The average exposed thickness of the FCMT is approximately 600 m (McKee, 1970). McKee (1970) identified a cooling break along the northwest edge of the caldera marked by unwelded tuff, but the cooling break disappears laterally and subsequent mapping concludes that the ignimbrite sequence is a single cooling unit (Emmons and Eng, 1995). The southern edge of the FCM is mapped as a caldera ring fault by McKee (1970), but otherwise faults in the FCM are rare. We suspect the tuff blanketed its collapse faults. In the eastern part of the caldera, the FCMT crops out as multi-tiered cliffs that represent individual ash flows that welded as a single cooling unit. Samples of FCMT consist of an ash matrix, typically with phenocrysts of quartz and feldspar, although the basal unwelded tuff and fiamme in the lowermost few ignimbrites are aphyric (Varve et al., 2011). The ash matrix varies in colour, occurring as pale grey, various shades of pinkish-grey, or purple-grey. Quartz phenocrysts occur in two varieties, clear or smoky, that range from from light grey to nearly black in colour. Sanidine phenocrysts are more abundant than plagioclase in the tuffs. Rare pyroxene and zircon phenocrysts occur in the upper flows, but hydrous phases are absent in all FCMT ignimbrites. The FCMT commonly includes pumice, which occurs as frothy, uncompacted blocks, or as variably flattened fiamme. Highly flattened fiamme are black, rehydrated, and devitrified (Figure 3F), occasionally with cm-scale visible spherulites, and define a eutaxitic texture in the FCMT. Notably, in the lower tuffs both frothy pumice in unwelded tuff and rehydrated black fiamme in welded tuff tend to be aphyric, whereas the variably flattened pumices in the upper tuffs contain phenocrysts of similar composition and abundance to the matrix. Lithic fragments, commonly of porphyritic andesite, are more abundant in the lower tuffs than in the upper tuffs. Thick sequences of lavas of the NNR are exposed in the northernmost Shoshone Range (Figure 3G) and in the Sheep Creek Range, just north and east of Battle Mountain and the FCM (Figure 1). NNR lavas typically overlie gravels or lacustrine sedimentary rocks that unconformably overlie Paleozoic sedimentary rocks and Eocene-Oligocene volcanic rocks (John et al., 2000). In the Mule Canyon area of the northern Shoshone Range, mafic and intermediate dykes locally cut the NNR lavas and commonly correspond to the NNR aeromagnetic anomaly. Compositionally, the NNR lavas are tholeiitic and range from olivine basalt to porphyritic clinopyroxene-plagioclase trachydacite and rhyolite. A sequence of thin basaltic lava flows and dykes interbedded with lacustrine sedimentary rocks in the Tobin Range are dated at 14.3 Ma (Unit Tyb, Gonsior and Dilles, 2008) and may be NNR flows. Although most exposures of HAOT are in southern Oregon or northeastern California, an isolated flow remnant of HAOT is located along Interstate 80 east of Golconda Summit approximately 40 km northwest of Battle Mountain (Figure 3H) (Hart et al., 1984). We term this the Pumpernickel Valley flow, which has an 40Ar-39Ar age of 5.44 +/- 0.24 Ma (Cousens et al., 2013). A fault cuts the east side of the mesa and exposes at least three flows of dense, mostly aphyric and commonly vesicular basalt with rare anhedral plagioclase phenocrysts. The Buffalo Valley volcanic field includes late Pliocene mafic lava flows and pyroclastic rocks on the south side of Battle Mountain, the north end of the FCM, and in the central FCM (2.75 to 4.15 Ma), and Quaternary spatter cones (Figure 3A) and associated lava flows along the west side of the FCM (2.00 to 1.15 Ma) (Arehart and Coolbaugh, 2005; Cousens et al., 2013). Volcanic rocks along the south side of Battle Mountain include aa lava flows up to 4 m thick and beds of scoria and spatter deposits that commonly include minor olivine and plagioclase phenocrysts. Plagioclase and olivine megacrysts are commonly seen in the lavas. At the north end of the FCM, approximately twenty Pliocene lava flows are exposed that include minor olivine and plagioclase phenocrysts in a dark grey matrix. The central basin of the southern FCM caldera is partially filled by lake sediments that are capped by a flat-lying, 4.02 Ma basalt lava flow with 2-5% fresh olivine and minor plagioclase phenocrysts. Quaternary spatter cones were emplaced along the northwest side of the FCM, possibly controlled by a range-bounding fault. Although there are slight age differences among the cones, all are similar petrographically. The scoria and lava flows are highly vesicular, and ropy flow tops can be discerned on some of the lava flows. Both flows and pyroclasts include minor euhedral olivine and plagioclase crystals 1–2 mm in size, as well as rare megacrysts of both olivine and plagioclase up to 5 cm in size. Rare amphibole megacrysts are found in both spatter and lava flows. The matrices of both spatter and lavas are glassy to finely crystalline, suggesting rapid cooling. Northern Nevada, and in particular the region surrounding the Fish Creek Mountains, is a microcosm of igneous activity in the Great Basin of the western United States. Although mafic to intermediate plutonic and volcanic rocks are found in the Great Basin, the largest igneous events are largely felsic in composition, represented by the numerous calderas and ignimbrites of the Eocene to Miocene “Ignimbrite Flare-up” (Best et al., 2013b; Henry and John, 2013). From the point of view of geologists work in accretionary margins, it is interesting to think about what the effect of compression and deformation would be in a region with an igneous rock record similar to that of the Fish Creek Mountains: rocks with variable sources (both mantle and crustal) and origins (continental arc, rifting, intraplate) would be intimately folded and interleaved, such that the first conclusion drawn would be that the rocks are likely to be related. Burial and metamorphism might obscure the time gaps between the various disparate units, and it would require a significant amount of work to distinguish the lack of relationships between the igneous rocks of the region. This manuscript is a summary of field and petrological work performed by numerous researchers and students at the Ottawa-Carleton Geoscience Centre, the Nevada Bureau of Mines and Geology, the Geological Survey of California, and the US Geological Survey. Thanks to Bill Wise and Art Sylvester for inspiring original work in the Lake Tahoe region, to George Saucedo, Dave Wagner, Bruce Pauly, Russell Towle, Cathy Busby, Keith Putirka, Jim Faulds, Larry Garside, Steve Castor, Ed du Bray, Joe Colgan, and Kathryn Watts for their collaborations. Arehart, G.B. and Coolbaugh, M.F. (2003) Dating of young igneous rocks associated with geothermal systems in the Great Basin, http://www.unr.edu/geothermal/pdffiles/AgeDatingV5.pdf. Arehart, G.B. and Coolbaugh, M.F. (2005) Dating of young igneous rocks associatred with geothermal systems in the Great Basin, Geothermal Technologies Program, Exploration, Peer Review Report. US Department of Energy, p. 4. Best, M.G., Gromme, S., Deino, A.L., Christiansen, E.H., Hart, G.L. and Tingey, D.G. (2013b) The 36-18 Ma Indian Peak-Caliente ignimbrite field and calderas, southeastern Great Basin, USA: Multicylcic super-eruptions. Geosphere 9, 1562-1636. Blakely, R.J. and Jachens, R.C. (1991) Regional study of mineral resources in Nevada: Insights from three-dimensional analysis of gravity and magnetic anomalies. Geol. Soc. Amer. Bull. 103, 795-803. Busby, C.J., Hagan, J., Putirka, K., Pluhar, C., Gans, P., Wagner, D., Rood, D., DeOreo, S. and Skilling, I. (2008b) The Ancestral Cascades arc: Cenozoic evolution of the central Sierra Nevada (California) and the birth of the new plate boundary, in: Wright, J.E., Shervais, J.W. (Eds. ), Ophiolites, Arcs and Batholtihs: A Tribute to Cliff Hopson, Geological Society of America Special Paper 438. Geological Society of America, Boulder, pp. 331-378. Christiansen, R.L. and McKee, E.H. (1978) Late Cenozoic volcanic and tectonic evolution of the Great Basin and Columbia intermontaine regions, in: Smith, R.B., Eaton, G.P. (Eds. ), Cenozoic Tectonics and Regional Geophysics of the Western Cordillera, Boulder, CO., pp. 283-312. Colgan, J.P. (2013) Reappraisal of the relationship between the northern Nevada Rift and Mocene extension in the northern Basin and Range province. Geology 41, 211-214. Colgan, J.P., Dumitru, T.A., McWilliams, M. and Miller, E.L. (2006a) Timing of Cenozoic volcanism and Basin and Range extension in northwest Nevada: New constraints from the northern Pine Forest Ridge. Geol. Soc. Amer. Bull. 118, 126-139. Colgan, J.P., Dumitru, T.A., Reiners, P.W., Wooden, J.L. and Miller, E.L. (2006b) Cenozoic tectonic evolution of the Basin and Range province in northwestern Nevada. Amer. J. Sci. 306, 616-654. Colgan, J.P., Egger, A.E., John, D.A., Cousens, B., Fleck, R.J. and Henry, C.D. (2011) Oligocene and Miocene arc volcanism in northeastern California: Evidence for post-Eocene segmentation of the subducting Farallon plate. Geosphere 7, 733-755. Colgan, J.P., John, D.A., Henry, C.D. and Fleck, R.J. (2008) Large-magnitude Miocene extension of the Eocene Caetano caldera Shoshone and Toiyabe Ranges, Nevada. Geosphere 4, 107-130. Cousens, B.L., Henry, C.D. and Gupta, V. (2012) Distinct mantle sources for Pliocene-Quaternary volcanism beneath the modern Sierra Nevada and adjacent Great Basin, northern California and western Nevada, USA. Geosphere 8, 562-580. Cousens, B.L., Prytulak, J., Henry, C.D., Alcazar, A. and Brownrigg, T. (2008) The geology, geochronology and geochemistry of the Miocene-Pliocene Ancestral Cascades Arc, northern Sierra Nevada, California/Nevada: The roles of the upper mantle, subducting slab, and the Sierra Nevada lithosphere. Geosphere 4, 829-853. Cousens, B.L., Wetmore, S. and Henry, C.D. (2013) The Pliocene-Quaternary Buffalo Valley Volcanic Field, Nevada: Post-extension, intraplate magmatism in the north-central Great Basin, USA. J. Volc. Geotherm. Res. 268, 17-35. Daley, E.E. and DePaolo, D.J. (1992) Isotopic evidence for lithospheric thinning during extension: southeastern Great Basin. Geology 20, 104-108. Deino, A.L. (1985) Stratigraphy, chemistry, K-Ar dating, and paleomagnetism of the Nine Hill Tuff, California-Nevada: Part 1. University of California Berkeley, p. 338. Dickinson, W.R. (2006) Geotectonic evolution of the Great Basin. Geosphere 2, 353-368. Dickinson, W.R. and Snyder, W.S. (1978) Plate tectonics of the Laramide orogeny, in: Matthews, V., III (Ed. ), Laramide folding associated with basement block faulting in the western United States, Geological Society of America Memoir, pp. 355-366. Dickson, L.D. (1997) Volcanology and geochemistry of Pliocene and Quaternary basalts on Citadel Mountain, Lunar Crater Volcanic Field, Pancake Range, Nevada, Department of Geosciences. MSc thesis, University of Nevada, Las Vegas, Las Vegas, p. 133.
du Bray, E.A., John, D.A. and Cousens, B.L. (2014) Petrologic, tectonic, and metallogenic evolution of the southern segment of the ancestral Cascades magmatic arc, California and Nevada. Geosphere 10, 1-39. doi: 10.1130/GES00944.1. Emmons, D.L. and Eng, T.L. (1995) Map 103, Geologic map of the McCoy mining district, Lander County, Nevada, 1 ed. Nevada Bureau of Mines and Geology, Reno. Ernst, R.E. (2014) Large Igneous Provinces. Cambridge University Press, 653 p.
Ernst, R.E. and Buchan, K.L. (2001) Large mafic magmatic events through time and links to mantle-plume heads, in: Ernst, R.E., Buchan, K.L. (Eds. ), Mantle Plumes: Their Identification Through Time. Geological Society of America, Boulder, Colorado, pp. 483-575. Ernst, R.E. and Jowitt, S.M. (2013) Large Igneous Provinces (LIPS) and their metallogeny, in: Colpron, M., Bissig, T., Rusk, B.G., Thompson, J.F.H. (Eds. ), Tectonics, Metallogeny, and Discovery: The North American Cordillera and Similar Accretionary Settings. Soceity of Economic Geologists, Special Publication, Denver, pp. 17-51. Farmer, G.L., Glazner, A.F., Wilshire, H.G., Wooden, J.L., Pickthorne, W.J. and Katz, M. (1995) Origin of late Cenozoic basalts at the Cima volcanic field, Mojave Desert, California. J. Geophys. Res. 100, 8399-8415. Farmer, G.L., Perry, F.V., Semken, S., Crowe, B., Curtis, D. and DePaolo, D.J. (1989) Isotopic evidence on the structure and origin of subcontinental lithospheric mantle in southern Nevada. J. Geophys. Res. 94, 7885-7898. Glazner, A.F., Farmer, G.L., Hughes, W.T., Wooden, J.L. and Pickthorn, W. (1991) Contamination of basaltic magma by mafic crust at Amboy and Pisgah Craters, Mojave Desert, California. J. Geophys. Res. 96, 13673-13692. Gonsior, Z.J. and Dilles, J.H. (2008) Timing and evolution of Cenozoic extensional normal faulting and magmatism in the southern Tobin Range, Nevada. Geosphere 4, 687-712. Hart, W.K. (1985) Chemical and isotopic evidence for mixing between depleted and enriched mantle, northwestern USA. Geochim. Cosmochim. Acta 49, 131-144. Hart, W.K., Aronson, J.L. and Mertzman, S.A. (1984) Areal distribution and age of low-K, high-alumina olivine tholeiite magmatism in the northwestern Great Basin. Geol. Soc. Amer. Bull. 95, 186-195. Hart, W.K., Carlson, R.W. and Shirey, S.B. (1997) Radiogenic Os in primitive basalts from the northwestern USA: Implications for petrogenesis. Earth Planet. Sci. Lett. 150, 103-116. Henry, C.D. (2008) Ash-Flow Tuffs and paleovalleys in northeastern Nevada: Implications for Eocene paleogeography and extension in the Sevier hinterland, northern Great Basin. Geosphere 4, 1-35. Henry, C.D., Cousens, B., John, D.A. and Colgan, J.P. (2009) Reestablishment of the Ancestral Cascades arc in western Nevada and eastern California by rollback of the shallow Farallon sdlab, EOS, Trans. Amer. Geophys. Union, Fall Mtg. Suppl., abs. V41B-2175. Henry, C.D. and John, D.A. (2013) Magmatism, ash flow tuffs, and calderas of the ignimbrite flareup in the western Nevada volcanic field, Great Basin, USA. Geosphere 9, 1-58. Humphreys, E., Hessler, E., Dueker, K., Farmer, G.L., Erslev, E. and Atwater, T. (2003) How Laramide-Age Hydration of North American Lithosphere by the Farallon Slab Controlled Subsequent Activity in the Western United States. Internat. Geol. Rev. 45, 575-595. Humphreys, E.D. (1995) Post-Laramide removal of the Farallon slab, western United States. Geology 23, 987-990. John, D., du Bray, E.A., Box, S.E., Blakely, R.J., Fleck, R.J., Vikre, P.G., Cousens, B. and Moring, B.C. (2012) Late Cenozoic Magmatic and Tectonic Evolution of the Ancestral Cascade Arc in the Bodie Hills, California and Nevada: Insights from Integrated Geologic, Geophysical, Geochemical and Geochronologic Studies, EOS, Transactions American Geophysical Union, Fall Meeting Supplement, San Francisco, abs V33B-2860. John, D.A., Henry, C.D. 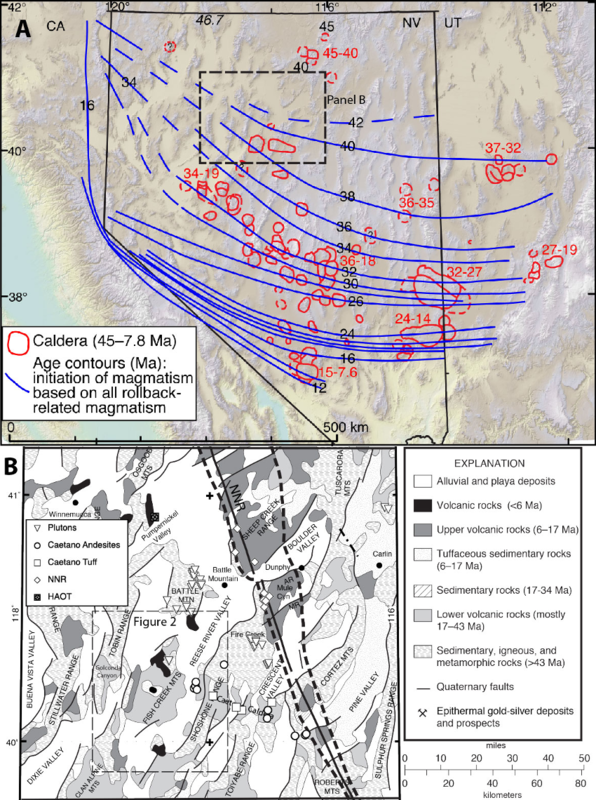 and Colgan, J.P. (2008) Magmatic and tectonic evolution of the Caetano caldera north-central Nevada: A tilted, mid-Tertiary eruptive center and source of the Caetano Tuff. Geosphere 4, 75-106. John, D.A., Hofstra, A.H., Fleck, R.B., Brummer, J.E. and Saderholm, E.C. (2003) Geologic Setting and Genesis of the Mule Canyon Low-Sulfidation Epithermal Gold-Silver Deposit, North-Central Nevada. Econ. Geol. 98, 425-463. John, D.A., Wallace, A.R., Ponce, D.A., Fleck, R.B. and Conrad, J.E. (2000) New perspectives on the geology and origin of the northern Nevada Rift, in: Cluer, J.K., Price, J.G., Struhsacker, E.M., Hardyman, R.F., Morris, C.L. (Eds. ), Geology and Ore Deposits 2000: The Great Basin and Beyond, Symposium Proceedings. Geological Society of Nevada, pp. 127-154. Johnsen, R., Smith, E.I. 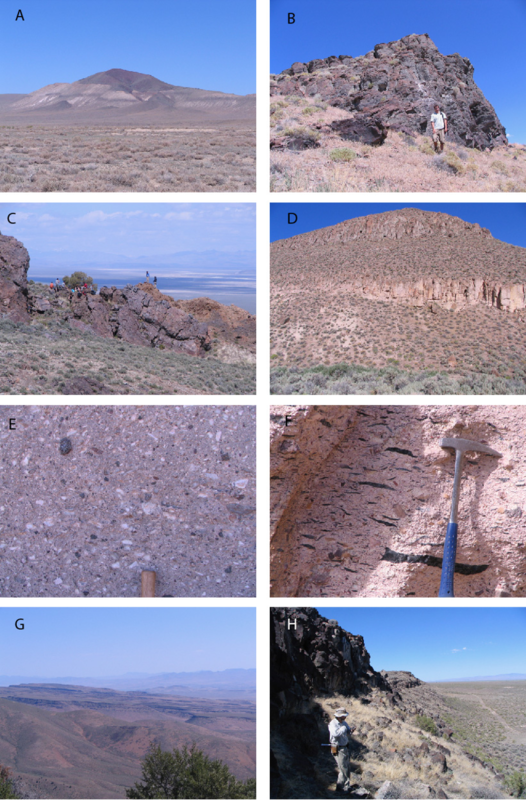 and Biek, R. (2010) Subalkaline volcanism in the Black Rock Desert and Markagunt Plateau volcanic fields of south-central Utah, in: Carney, S.M., Tabet, D.E., Johnson, C.L. (Eds. ), Geology of South-central Utah. Utah Geological Association, pp. 109-150. Kempton, P.D., Fitton, J.G., Hawkesworth, C.J. and Ormerod, D.S. (1991) Isotopic and trace element constraints on the composition and evolution of the lithosphere beneath the southwestern United States. J. Geophys. Res. 96, 13713-13735. McKee, E.H. (1970) Fish Creek Mountains Tuff and Volcanic Center, Lander County, Nevada. United States Geological Survey Professional Paper 681, Washington DC. Menzies, M.A., Arculus, R.J., Best, M.G., Bergman, S.C., Ehrenberg, S.N., Irving, A.J., Roden, M.F. and Schulze, D.J. (1987) A record of subduction process and within-plate volcanism in lithospheric xenoliths of the southwestern USA, in: Nixon, P.H. (Ed. ), Mantle Xenoliths. John Wiley and Sons, London, pp. 59-74. Miller, J.S., Glazner, A.F., Farmer, G.L., Suayah, I.B. and Keith, L.A. (2000) A Sr, Nd, and Pb isotopic study of mantle domains and crustal structure from Miocene volcanic rocks in the Mojave Desert, California. Geol. Soc. Amer. Bull. 112, 1264-1279. Nelson, S.T. and Tingey, D.G. (1997) Time-transgressive and extension-related volcanism in southwest Utah and vicinity. Geol. Soc. Amer. Bull. 109, 1249-1265. Noble, D.C. (1972) Some observations on the Cenozoic volcano-tectonic evolution of the Great Basin, western United States. Earth Planet. Sci. Lett. 17, 142-150. Ormerod, D.S. (1988) Late- to post-subduction magmatic transitions in the Western Great Basin, USA. PhD thesis, The Open University, Milton Keynes, p. 313. Ormerod, D.S., Hawkesworth, C.J., Rogers, N.W., Leeman, W.P. and Menzies, M.A. (1988) Tectonic and magmatic transitions in the Western Great Basin, USA. Nature 333, 349-353. Rogers, N.W., Hawkesworth, C.J. and Ormerod, D.S. (1995) Late Cenozoic basaltic magmatism in the Western Great Basin, California and Nevada. J. Geophys. Res. 100, 10287-10302. Rutherford, M.J., Devine, J.D. and Barclay, J. (1998) Changing magma conditions and ascent rates during the Soufriere Hills eruption on Montserrat. GSA Today 8, 1-7. Stevens, C., Cousens, B. and Henry, C.D. (2012) Tertiary magmatic events in the Fish Creek Mountains, Great Basin, north-central Nevada, GAC-MAC Annual Meeting, p. 135. Stewart, J.H. and Carlson, J.E. (1976) Map 50, Geologic map of north-central Nevada. Nevada Bureau of Mines and Geology, Reno. Stickney, E.K. (2004) The volcanology and petrogenesis of the northern Lunar Crater Volcanic Field, Nye County, Department of Geosciences. MSc thesis, University of Nevada, Las Vegas, Las Vegas, p. 78. Theodore, T.G. (2000) Geology of pluton-related gold mineralization at Battle Mountain, Nevada, Center for Mineral Resources, Monographs in Mineral Resource Science No. 2, Tucson, AZ., p. 271. Timmermans, A.C. (2015) A Geochemical Study of Cenozoic Magmatism Along an East-West Transect from Central Great Basin, Nevada to the Ancestral Cascade Arc, California – A Compositional Journey Over Space and Time, Earth Sciences. PhD thesis, Carleton University, Ottawa, p. 295. Varve, S., Stevens, C., Cousens, B. and Henry, C.D. (2011) Multiple magmatic events through the Tertiary and Quaternary in the Fish Creek Mountains, Great Basin, north-central Nevada (abs), GAC-MAC-SEG-SGA Annual Meeting, Ottawa, abs. GS4-P73. Varve, S.A., Cousens, B.L. and Henry, C.D. (2012) Determination of the volcanic origin of the Fish Creek Mountains Tuff, Battle Mountain, Nevada, GAC-MAC Annual Meeting, p. 146. Wallace, A.R. and John, D.A. (1998) New studies of Tertiary volcanic rocks and mineral deposits, northern Nevada Rift, in: Tosdal, R.M. (Ed. ), Contributions to the Gold Metallogeny of Northern Nevada. United States Geological Survey, Menlo Park, CA, pp. 264-278. Yogodzinski, G.M., Naumann, T.R., Smith, E.I., Bradshaw, T.K. and Walker, J.D. (1996) Evolution of a mafic volcanic field in the central Great Basin, south central Nevada. J. Geophys. Res. 101, 17425-17445. Zoback, M.L., McKee, E.H., Blakely, R.J. and Thompson, G. (1994) The northern Nevada Rift: Regional tectono-magmatic relations and middle Miocene stress direction. Geol. Soc. Amer. Bull. 106, 371-382.